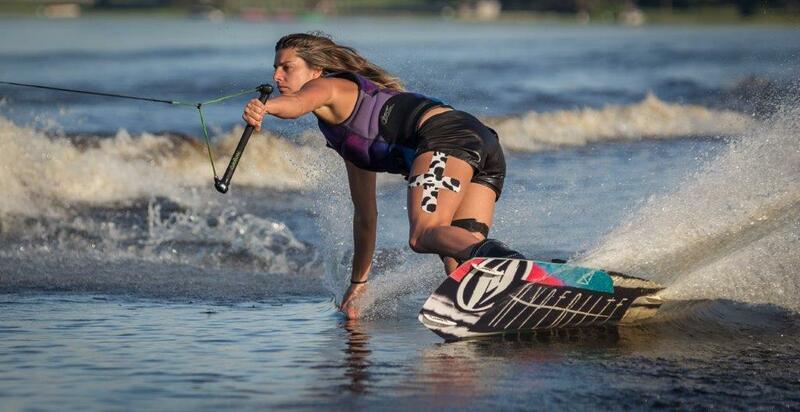 Meet Bec Gange – an Aussie superstar in the sport of wakeboarding. Bec won the World Championships in 2014, is the 8 time Australian Champion, and has even been the first women in the world to land some extremely difficult tricks. Currently Bec’s living, training and competing in the USA and will be back down-under come summer. What’s your favourite colour RockTape and why? You’re from Mildura which is definitely an ideal location for wakeboarding given you are right next to the Murray River. How did you get into the sport, and what was the defining moment when you decided to make this a career? We got a boat when I was 11 but didn’t start wakeboarding till I was 13. I enjoyed water-skiing and my brother was into wakeboarding. He would weigh the boat down with water, this makes the wake bigger, which isn’t good for skiing. I slowly started wakeboarding more and more, I learnt new tricks and fell in love with it. From then on all I wanted to do is have the endless summer. I started traveling to the USA in 2008 but only went pro in 2013. I didn’t travel to the USA in 2011 and 2012 to work and save money to be able to spend the 6 months training and traveling for the Pro Circuit in the USA. That was the moment I realised I really wanted to have a go at making it Pro. I didn’t want to get older and look back on my life wondering if I could have been a World champion. You’re lucky to be living in ‘endless summer’ by spending the Australian winter in the USA at the moment. What are some of the other lifestyle pros, and perhaps some of the challenges, that come with being a professional wakeboarder? The best part is that I never have winter. I can’t handle the cold so it’s great always having summer. It’s so much fun traveling the world doing something I love. I find it so rewarding getting to teach beginners to get up for the first time or teaching people new tricks. I’m a pretty competitive person so I enjoy performing well in contests. The biggest challenge is that it’s sometimes hard to find a balance between working a full-time job and wakeboarding. Being such a new sport there isn’t a large budget. Another challenge is my body gets very sore and tired, not only do we train on the water but there is a lot of off water training as well. You can take a lot of hard falls while wakeboarding which can take a few days to recover. The season in the USA can become very tiring with all the travel and the time away from my family. How does a competition work? Do you do multiple events? And how does the scoring to determine the winner work? Each contest will have its own sponsors. The boat company that sponsors the event will provide the boat that all the competitors will wakeboard behind. A lot of contests will run 1-2 days for the pros. There is a start buoy and an end buoy. Once the boat goes past the first buoy you start your tricks. You can roughly get 5-6 tricks depending on the speed you choose and the length of the course. The boat will then turn around and you will complete a second pass. The 2 passes are about 2 minutes. If you fall the boat will pick you up and you get another go, fall again and your pass is finished. There are 3 judges in the boat. There are no set points for each trick. You get judged on your overall performance, the difficulty of the tricks, the execution of each trick, the intensity and your style. Through the USA season we have a lot of contests back to back. Roughly for the women there are 10-12 contests starting in March through to September. The tricks in wakeboarding have some crazy names. How does a trick get named, and what are a few of the key terms that the average spectator should learn? Most tricks were named by the person that landed it for the first time. A lot of those were young kids so they had some funny names. A few key terms worth knowing for spectators is if the rider is edging toeside or heelside. To determine that is which way they are edging into the wake to do their trick. If they are edging into the wake on their heels then it’s heelside. Also, the degree of spin, so 180, 360, 540. Then a few basic inverts such as backroll, tantrum (backflip), frontroll, scarecrow (frontroll with a frontside 180). Stepping up from that is understanding whether the rider is spinning backside or frontside. To know which way they are spinning is which way their body faces the boat when initiating the spin. If they spin and their chest faces the boat first then it’s frontside. If their back faces the boat first then its backside. Back in 2013 you were the first ever female to land a Whirlybird 540. Can you talk us through what that is? A whirlybird 540 is a heelside backflip (tantrum) and you spin 540 degrees with the handle over your head. You then land in what’s called the wrapped position. Where the handle is at your front hip but your arm is behind your back. I am the only female to have ever landed them. And what is the next trick in your sights that you’ve been working on? I’ve been working on landing a 720 which is two full 360 rotations. Also getting my tricks consistent for contests. What tournaments are coming up on the horizon for you? Any chance we will get to see you compete in Australia this summer? I have worlds coming up in Toronto. The 2nd stop of the Malibu pro in Austria and the 3rd stop in Japan. In the Australian summer, there will be the Australian Open, the destinations and dates are yet to be announced. Then I will also have the Australian Nationals and the Moomba Masters in Melbourne in March. Given the nature of the sport you do, there must be a large mental component to it. From overcoming fear when learning new skills, to bringing intense concentration to doing a perfect run in competition. What are some of the mental strategies you use regularly? I spent a lot of time with a sports psychiatrist in 2014 which I have kept a lot of those exercises and routines going. I’ll do a relaxation that involves going over my tricks fluently in my head and picturing myself doing well at events and in practise. A lot of training for my brain is to calm my nerves in a situation that I might not feel comfortable or I am nervous about. What’s something you’ve learnt from sport that is a lesson you apply to the rest of your life? To make sure I’m always having fun and to enjoy what I’m doing. Nothing is easy and I always have to keep trying and pushing towards that next goal. Who is someone who inspires you – what have you learnt from them? I’ve never had a sport hero that I look up to. I believe all athletes are amazing in their own way. I think my biggest inspiration are my parents. I always wanted to be like them and have the drive that they have – when I want something and taught me to work hard for it. Outside of wakeboarding what are you up to – studying or working or something else? I work a part time or full time job in Australia for the 6 months of summer. I also run a houseboat hire company called Tsunami Houseboat, run wakeboard camps and coach wakeboarding and water-skiing. What are your proudest moments so far? Being the first and only female to land the whirlybird 540 and winning Female trick of the year for it in 2013. Winning the World Championships in 2014 and the World Cup in 2013. Also named Australian best female rider of the year for 2014-2015 and best trick of the year for 2014-2015. Where can people find you on the web, or follow your journey?